The newest NHS inductees prepare to blow out their candles. 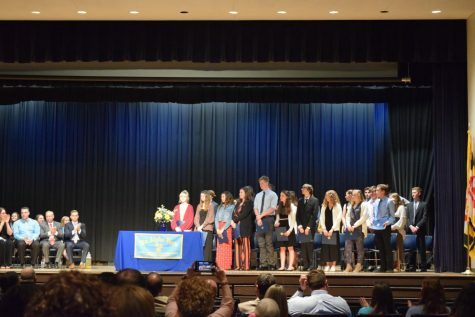 The classes of 2019 and 2020, took the pledge of character, scholarship, leadership, and service as they were inducted into the National Honors Society on Wednesday, April 3, 2019. The theme of the night was heroes, from the Marvel Cinematic Universe. The phrase for the night was “Heroes are made by the paths they choose, not the powers they are graced with.” President of the National Honor Society, senior Grace Beres, started off the night by lighting the first candle. During the ceremony, four other seniors in the organization lit the remaining candles that represented the four characteristics of National Honor Society. Principal Tom Sites, current members, and former NHS President, now Air Force Captain, James Simons, spoke during the induction. The new inductees walked down the aisle surrounded by family and friends, and lit their candles together, signifying the completion of the ceremony. The newest 83 members now proudly walk the SDHS hallways. NHS president, Grace Beres, lights the first candle.